Full disclosure – I love the TV show Rizzoli & Isles so, I was pretty sure that I was going to enjoy this book before I even cracked it. I find the relationship between the two characters (on the show) to be fantastic and only hoped that it would be similar in the book. I wasn’t disappointed. I read this book in record time. In case you don’t watch the show, Maura is the ME and Jane is a Detective. They work together in Boston to solve horrible crimes. The horrible crimes in this book are the murder of two Nuns, one of which is pregnant; a woman who Maura discovers has leprosy; and an important businessman. There are a number of twists, some excellent betrayal, and I did not see the ending coming at all. I raced through the final chapters – I just had to know! But more than a great plot and excellent twists, my favourite part was the character development. I really felt like I knew Maura and Jane and were allowed to get in their heads. This is the third book in the series, I haven’t read the first two, but I think even without watching the show there was enough back story, and characterization that I really loved these women and I rooted for them. 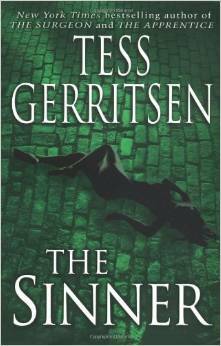 I have two more Gerritsen’s on my shelf waiting for me, it is going to be hard not to gobble them up right away. The way that Gerritsen weaves the stories together, and misleads us, is brilliant. God, I hope I’m half the writer she is some day.